Mel Blanc first performed on radio when he was 15 years old. Although he would become more famous for his work in animation, radio was Mel Blanc’s first love. He remained active in it his entire life. This program includes Dennis Nyback’s favorite radio themed cartoons and short films from 1929 to 1943. Coo Coo Nut Grove (1936) WB Cartoon. and George Raft dance and drink. A caricatured Ben Bernie MC’s as the radio broadcasting bandleader. Jokes comment on the feud between Ben Bernie and radio journalist Walter Winchell. Hi De Ho (1934) Live action short. Cab Calloway appears at the Cotton Club, on a show being broadcast on the radio. One of his fans is a railroad porter who is worried that while he is on the road his wife ( Fredi Washington) will betray him. Cab advises the man to buy a radio to keep his wife happy and at home. Captain Henry’s Radio Show (1933) Live action. One of the most popular radio shows on the 1930s was the Maxwell House Showboat This film shows a broadcast which includes the popular radio performers Annette Hanshaw and Lanny Ross. 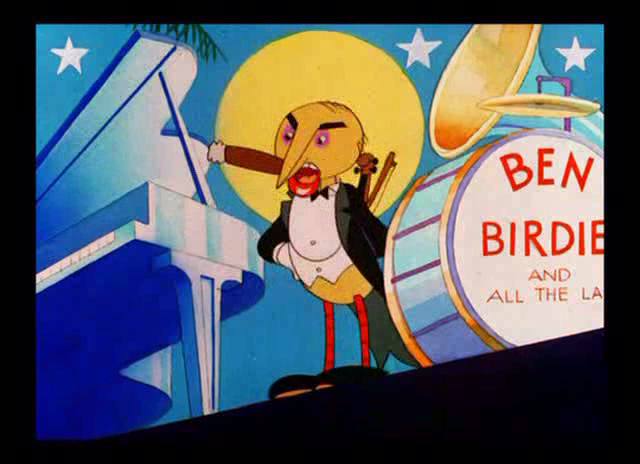 I Love to Singa (1936) WB Cartoon Young Owl Jolson is a disappointment to his classical music loving father. Kicked out of the house, he finds redemption singing jazz on an amateur hour radio show hosted by Jack Bunny. Midnight Melodies (1936) Loretta Lee, Ed Paul, Jack Gilford Live action. Incredibly rare film featuring the Ed Paul Orchestra doing a radio broadcast. Featured throughout is the young comedian Jack Gilford, making his first of many film and television appearances, but eight years before his next film appearance. GI Journal with Mel Blanc (c1944) Live action. Army-Navy Screen Magazine recreation of a radio broadcast features Mel Blanc as the character Sad Sack. Extremely rare footage of Blanc performing live. Also featuring Lucille Ball and Kay Kyser. God Bless America (1943) Live action. Technicolor clip from This is the Army (1943). Features Kate Smith introducing the famous Irving Berlin song in the form of a radio broadcast heard by the nation and by soldiers over seas. Among the listeners are George Murphy, who later became a United States Senator, and a fresh faced nobody named Ronald Reagan. For more information about Mel Blanc, see the Archives of this website. Another recommended method of deepening your knowledge is to attend Mel Blanc: The Portland Years, our upcoming lecture series.